This is a basic recipe of the Mexican cuisine. It is very similar to the green salsa and we are sure that at some point you have tried or you have heard talking about the green salsa. The difference that the tomatillo salsa has with the green salsa , is that more tomatillos and more chilies are used in its preparation therefore its freshness, acidity and hotness increase . Moreover the preparation technique is curious because 2 cooking stages are performed to mix well the flavors. The tomatillo salsa is perfect for having it always fresh in the fridge because it can be used in endless preparations like in appetizers , eggs , tacos , etc. It can even be used for snacking. The preparation technique that is used to make the salsa is very simple. The recipe is made with 6 serrano peppers and it is spicy, if you want to decrease the spiciness just use 3. When the tomatillos are bought pick the ones that are hard and that have an intense green color because this indicates that they are ripe. 15 minutes will be enough to make the salsa. 1/3 of a cup of Water (2.8 fl oz). Preferably use the water where the tomatillos and the chilies were cooked because it has more flavor. Mix the saucepan ingredients and bring the tomatillo salsa to a boil over high heat. 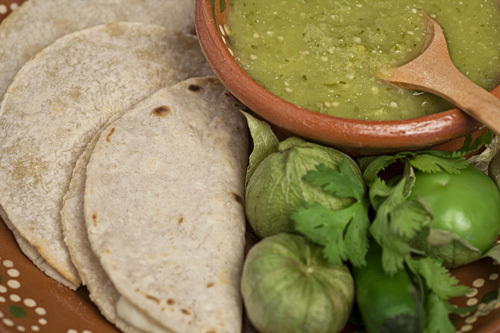 When the tomatillo salsa boils reduce to low heat and cook it for about 6 minutes, until it acquires a more intense green color; stir occasionally. * This salsa can last up to 10 days in the refrigerator. Recommendation: If you enjoyed the tomatillo’s acidic taste also prepare the tomatillo guacamole. Did you like the Tomatillo Salsa? Know more about the salsas with this book, that is full of very interesting information. A set of kitchen tools that will serve you for many preparations. Put the tomatillo salsa in a molcajete so it looks very Mexican.